New Jersey Oral & Maxillofacial Surgery Associates, P.C. If you have been told you need dentures or another dental prosthesis, you probably have a lot of questions. One of the biggest questions might be, “How can I best prepare for a proper fit?” Here is what you should know. First, you should be aware that the construction of a partial or full dental prosthesis is the first step in stabilizing and improving oral function, as well as in addressing overall facial aesthetics. When making this commitment, it is important to have a complete evaluation by a Board Certified oral and maxillofacial surgeon. Your evaluation will include a complete oral, facial, head, and neck clinical examination. We will also use in-office radiography such as Panorex and possibly cone beam computerized tomography (CBCT). 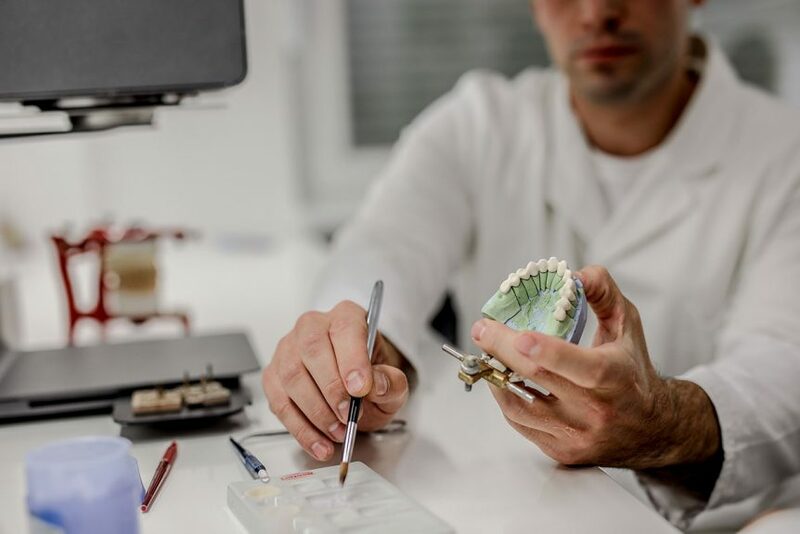 We will evaluate your remaining teeth for stability and determine which teeth will be helpful in the long-term stabilization of the planned dental prosthesis. We will also identify non-restorable teeth and recommend them for removal. A Board Certified oral and maxillofacial surgeon is uniquely qualified to develop a comprehensive treatment plan that allows all surgical procedures to be completed in a single visit, under general anesthesia if desired. Oral and maxillofacial surgeons are the only dental specialists that are fully licensed and accredited to provide general anesthesia in an outpatient office setting. This allows us to provide our patients with the most cost effective, time efficient, and comprehensive treatment possible. In addition, a Board Certified oral and maxillofacial surgeon can leave the dental arches and alveolar bone in an ideal state for the construction and comfortable fit of the appropriate dental prosthesis. While any dentist can extract teeth, shaping and refining the bone is best performed by an expert in oral surgery. At this point, patients can decide and plan for restorative treatment, potentially including the placement of dental implants. If you are honestly ready to get started, your first and most important decision should be to seek a comprehensive oral-facial evaluation by a Board Certified Oral & Maxillofacial Surgeon. Our surgeons are experienced, Board Certified, prepared and ready to provide this in depth personalized service. To schedule your first appointment we invite you to contact New Jersey Oral & Maxillofacial Surgery Associates, P.C. today. We have 3 full time, conveniently located offices servicing all of Bergen and Hudson counties, at Hackensack (201-342-7353), Ridgefield (201-941-9494), or North Bergen (201-867-0404) to insure your journey to better oral health. Welcome to New Jersey Oral & Maxillofacial Surgery! Service is at the core of everything we do. Our Hackensack, North Bergen and Ridgefield surgery team works together to provide a warm, comfortable and relaxing environment. Contact us today to request an appointment. Experience dentistry designed for you. Call us to reserve time with Dr. Barbieri, Dr. Colameo, Dr. Berardo & Dr. Wuebbels. New Jersey Oral & Maxillofacial Surgery has three locations: Hackensack, North Bergen and Ridgefield New Jersey! We would like to thank you for taking the time to visit our web site. We hope you will find this website to be a useful and interesting resource for all of your oral health concerns. This website is designed to make your visit to any of our three offices as pleasant and efficient as possible. We encourage our patients and referring doctors to make use of the information provided and to acquaint themselves with who we are and the services we provide. You will find answers to frequently asked questions, descriptions of the various procedures performed, and informative videos. As you navigate throughout the site you will notice for your convenience there is a detailed listing of specific pre and postoperative instructions, driving directions via a Google Maps link and written descriptions from multiple outlying locations that will facilitate your arrival. In addition, you can easily register, complete all forms, and download all necessary vital information from the comfort of your own home or office. If additional information is desired you may want to pay particular attention to the various web links that are placed in appropriate areas throughout the site. If you would like more information about any of the procedures that we offer or to schedule an appointment, please call any of our offices at the numbers listed above. We will do everything possible to ensure that your visit is pleasant and comfortable. For your convenience our office hour’s at all three locations are Monday through Friday from 9:00am until 5pm. The Ridgefield office is open for your convenience on Saturdays from 9:00am until 1:00pm. Experience dentistry designed for you. Call us to reserve time with New Jersey Oral & Maxillofacial Surgery Associates, P.C. (formerly, Barbieri, Colameo, Berardo & Wuebbels, Associates in Oral and Maxillofacial Surgery, P.C.). Located in Hackensack, North Bergen and Ridgefield New Jersey!